Well in theory it's 300 colours but in practice 99% red mixed with 1% blue is difficult to detect any difference between that and 100% red with the naked eye (at least with my old eyes it is). This was done using a Diamond hot end fitted to what was originally a RepRapPro Mendel 3 tricolour. The object is just a cylinder 80mm diameter by 90mm high, sliced as normal (single colour) using Slic3r, 3 perimeters, 3 base layers, no top and no infill, 3mm layer height, 0.5mm nozzle (the original diamond was 0.4mm). Then a script was used to go through the gcode file and insert a line after every layer change by looking for "G1 Z". The inserted line started with a M567 command to change the mixing ratios. 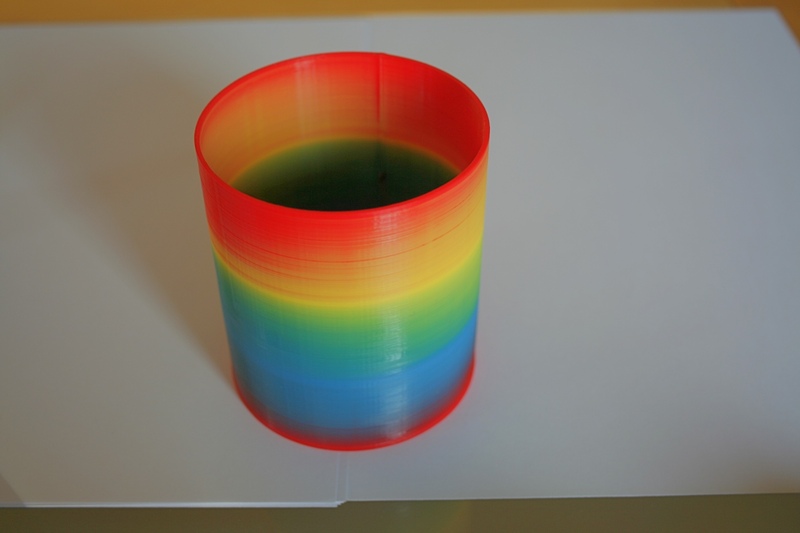 It started with filament A (red) at 100% and filaments B (blue) and C (yellow) at 0%. For each layer, filament A was reduced by 1% (0.01) and filament B increased by 1% until after 100 layers filament A was zero and filament B was 100%. At this point, filament B was then reduced by 1% every layer and filament C increased by 1% until after another 100 layers, filament B was zero and filament C was at 100%. From this point, filament C was then reduced by 1% and filament A increased by 1% until after another 100 layers we end up back where we started with filament A at 100% and the other two at zero. If the object had been taller than 90mm (300 layers), then the process would have repeated. I've take 3 pictures at different angles and hopefully you will be able to see that the colour "bands" are different. The reason is that as the filament comes out of the hot end, it is more like stripy tooth paste than fully mixed. 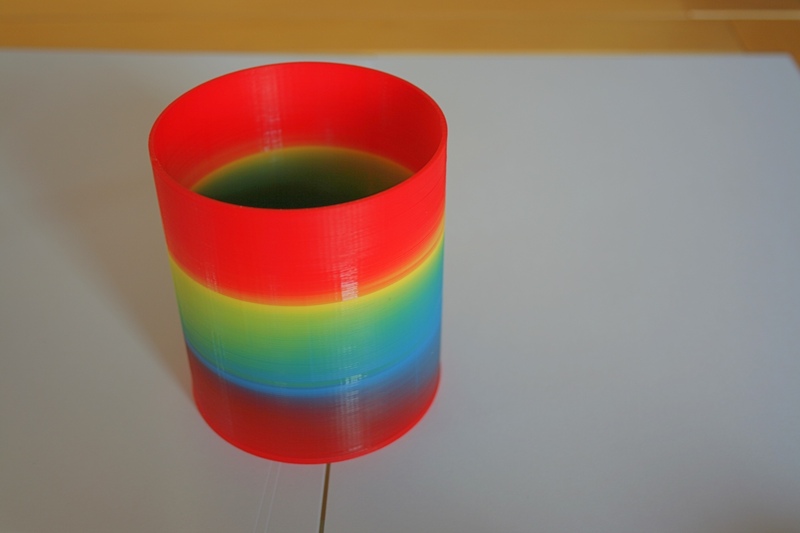 So, for each colour it is biased towards the side nearest that particular extruder. To prove this, I printed a 3 sided pyramid and orientated it so that each face was directly opposite one of the filament inputs. I then printed it using equal ratios of Red, Gold and Black. The resultant object 3 different coloured faces. One is a kind dark red, another bronze and the third is black. I'd like to take this opportunity to say a big thanks to the reprap community and especially those members who are active on these forums for all their help and assistance which has enabled me to create this "thingy". Very nice! Maybe someone will write a nice program with a user friendly interface for setting up layer-based filament mix changes. How well does the Diamond hot end work if you do a long print with just one colour and then switch to a different colour? I've heard that in mixing or switching hot ends, it can be hard to prevent the filament being extruded from back feeding up the heat breaks for the inactive filament. Not had a problem with "unused" filaments "backfeeding". I do most of my printing in single colour and when I want to switch to a different colour or do mixing, I just "turn on" the relevant extruder and away it goes. Of course, one has to keep filament loaded in all the inputs all the time. Initial loading of filaments is tricky. For me the solution was to load filament all the way to the end of the bowden tubes when I first fitted them. Then heat the hot end and slowly turn each extruder a few mm. Keep adjusting each extruder in turn until it starts to come out of the nozzle. If you don't do that, filament will back up in any unused inputs then cool and block the nozzle. Once the initial loading of filaments has been done, changing them is easy. I just heat the hot end to around 190degC, retract the filament slowly, then feed in the new one until it oozes out of the nozzle. Of course, it is important to only do one filament at a time. Make sure it is flowing freely before changing the next filament. It's also very important to ensure that the bowden tube goes all the way into the heat sink. If it's just 1mm short of the bottom of the hole, then it will melt and then solidify at this point causing a blockage. Bowden tubes also have to be tight with no "backlash". Use clips if necessary to keep them jammed in. Some people have reported problems with filament leaking out around the heat sink threads but I wrapped a few turns of PTFE tape around the threads when I fitted the heat sinks and didn't get that problem. Edited 1 time(s). Last edit at 04/02/2016 06:13PM by deckingman. This looks really good, because of you I had do order the Diamond Hotend too . Perhaps I will have a couple of technical questions later, should I PM you, or just use one of your threads instead? Edited 1 time(s). Last edit at 04/06/2016 01:44PM by Teilchen. Probably best if you PM me as questions specific to using the Diamond hot end would be "off topic" for any of my other threads. Maybe the best thing to do would be to start a new thread about the Diamond hot end, so that any information will be visible to others (but PM me when you do as I might not otherwise see it). i have a question for you. 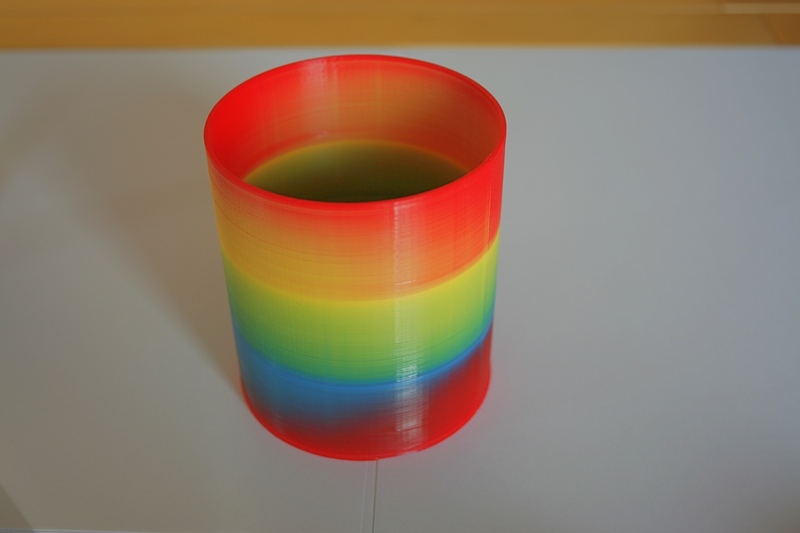 what the firmware you use for your 3d multicolor printer? i have a 3d printer with single extruder, and i try to add 2 extruder and diamond hotend. but something wrong with my 3d printer because when second extruder active, the printer moves in all 3 delta axes. i use marlin firmware. so, what should i do? Hi. I probably won't be much help. I have Duet electronics and use DC42's firmware fork so I have no knowledge of Marlin. Also, I know nothing about Delta printers - mine is an ageing Mendel variant which is busy printing parts for a CoreXY that I'm planning. Sorry. I am trying to use Repetier firmware. It allows for color mixing. Well I gave it a good go... generated gcode, wrote a gcode editing script to insert the various command on line change. But thus far all I can get my diamond head to do is clog. first one extruder, then the next then the last, round and round it goes clogging all the way. Edited 1 time(s). Last edit at 08/21/2016 08:54AM by Dust. I've noticed when I printed with one extruder, it also pushed the filament into the other channels and filled the PTFE tube completely. Then the other extruders had problems to extrude. I have a Cyclops, not a diamond, but the same thing might have happened to you too? Are there PTFE liners in the diamond? Edited 1 time(s). Last edit at 08/24/2016 03:15AM by Dust. With a mixing nozzle such as the Diamond, you have to have filament in all three inputs otherwise, yes it will feed back. On the Diamond, the Bowden tube must go all the way into the heat sink as far as the heat break. Even a small gap below the tube will allow a blockage. You have to jam the tubes in, lift the retainer and fit a clip under it such that they can't be pushed back. Experience has also taught me to use the lowest temperature possible. I had no problems printing PLA at 195deg C but when I upped it to 205, I got blockages in the "unused" inputs which I suspect was caused by heat creep. When you get a blockage like this, it also buggers up retraction and you get stringy prints. I think best practice would be to always use all 3 inputs but if you needed a single colour, you'd need to buy 3 rolls of filament and set mixing to 33:33:34 so that you are always pushing filament through all of the inputs. It means having a lot of filament laying around but one advantage of this would be to allow really fast print times. If you have a capable printer, the limiting factor for speed is how quickly you can melt the filament and for that you need a long melt zone. That's how the E3D volcanos work. But with a diamond hot end, we have 3 melt zones which, all other things being equal, should allow us to extrude 3 times as much filament as a single nozzle (if the heater can keep up with it). It's on my list of things to try when I get my (now 1.5 metre tall) 600mmx 600mm corexy finished. When you are printing with only one filament of the three, do you have the other two heaters on at normal temperature, on at reduced temperature (as in standard multiple nozzle printing with RRF), or off? I think I see, you mean it has a single heater? With my dual color e3d cyclops the filament got pushed pass the unused filament and filled the gap to the PTFE liner completely. Perfect scenario for a blockade. Blimey! Never had that happen with the Diamond. I'd have thought there must have been a fair bit of pressure for it to do that. Were you trying to extrude/print too fast perhaps? To be exact, it is a china clone of the e3d Cyclops. I raised the print temp to 210°C to be sure the stepper would be able to push the molten PLA through this long channel, maybe the filament got too soft?